Frank White photographed at his Madeira Park home in 1990 by Stephen Osborne. BELOW: Working on a truck. Clayton Bailey photograph. BOTTOM: Photo by Jan Brink. 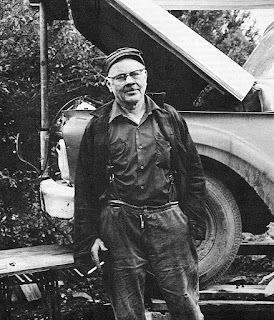 Frank White butchered hogs, delivered raw milk to dairies, hauled logs out of the woods, operated a waterworks, bit into the earth as an excavating contractor, and pumped gas at a station in a picturesque fishing village on the British Columbia coast. 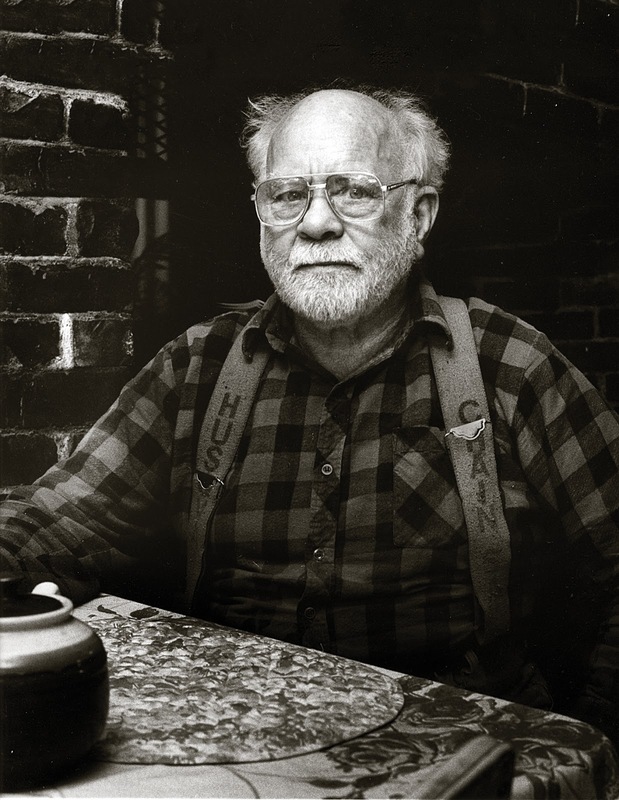 Late in life, at age 99, he added bestselling author to his resumé with “Milk Spills and One-Log Loads” (Harbour, 2013), a thoroughly engaging memoir of his time as a pioneer trucker. By the time he died on Oct. 18, at 101, he had a second title to his credit. with “That Went By Fast: My First Hundred Years.” He was thought to be the oldest active author in the province, if not the land. The books resulted from a prize-winning autobiographical magazine article published in 1974. For nearly four decades, he wrote scattered notes to jog his memory, snippets of facts and details which read like found poetry. The son then transcribed the tapes, resulting in a 180,000-word manuscript. At first, the results disappointed the senior White. “I can't believe a man's life can be made so small,” he complained. The son read aloud the results to an audience of two — his father's second wife, the former New Yorker writer and one-time war correspondent Edith Iglauer, and their Filipina caregiver. Their approval convinced the subject his life was worthy of being shared. The two volumes offer a rare glimpse into working-class life in a province where so many of those jobs have disappeared over the years. The elder White had lived so long his recollections of such things as logging with a winch known as a steam donkey crossed from the mundane to the historical. Franklin Wetmore White was born three months before the outbreak of the First World War on May 9, 1914, to Jean Wetmore (née Carmichael) and Silas Franklin White. The family lived in Aldergrove in British Columbia's fertile Fraser Valley, although the boy was born just across the frontier at Sumas, Wash.
His father had an adventurous life, including a stint as a barnstorming prize fighter, who worked carnivals by taking on local farm boys and other tough guys. Once married and settled, he operated a butcher shop in which young Frank learned to slaughter hogs at a young age. The boy also sold magazine subscriptions door to door and became so adept a driving that he operated a truck for his father years before he could legally drive. Many other jobs followed. He was an apprentice box-maker in British Columbia's bountiful Okanagan region, drove milk trucks, hauled freight, worked the woods as an independent, small-scale operator known as a gyppo logger. Known by his neighbours as a kindly and warm-hearted figure, he was also a voracious reader, though he mostly eschewed literature, preferring instead histories and obscure treatises on equipment and mechanical operations. For many years, he subscribed to Hansard, reading verbatim accounts of debates from the House of Commons in far-off Ottawa. These tended to occupy flat surfaces throughout his gas station, undoubtedly disappointing workers who used the men's room, where might be expected a more titillating publication. Frank White hugs Edith Iglauer. In 1939, Mr. White married Kathleen, known as Kay, Boley, a farmer's daughter with whom he had a successful union until her death in 1978. A few years later, while on a bus trip to New York City, he called on Ms. Iglauer, a widow who maintained homes in Manhattan and on British Columbia's Sunshine Coast. He told her he wanted to see the opera, about which he knew nothing other than it was one of her preferred entertainments. Theirs was a Green Acres relationship — he had spent years in logging camps with the manners to prove it, a self-described “bush ape,” while she travelled in the sophisticated milieu of the sorts who not only read the New Yorker, but produced it. He found in her a firecracker of enthusiasms for the arts, while she found in him a kindly, generous autodidact whose lack of formal education had not restricted an inquisitive mind. He had even built an early computer from designs in a magazine, using the machine to record the notes used in his memoirs. Mr. White died at his home in Garden Bay, B.C. He leaves Ms. Iglauer, whom he married in 2006 after a long courtship; a daughter, Marilyn Plant; sons Don White and Howard White; six grandchildren; and, eight great-grandchildren. He was predeceased by his first wife and by daughter Cynthia (Cindy) Wilson, who died in 2005. He was also predeceased by five siblings, including Wesley James White, a lance sergeant who was captured at Hong Kong and died of diphtheria in a Japanese prisoner-of-war camp in 1942. While he rarely left British Columbia in his first 60 years, Mr. White travelled extensively afterwards. On a trip to India, he could not bring himself to hire pedicabs, seeing it as too exploitive a mode of transportation. One day in Delhi, though, he got lost and in desperation engaged a pedicab to return to his hotel. Mr. White insisted on exiting the pedicab at the foot of every hill; he also insisted on buying the driver a meal at the hotel. In turn, the driver invited Mr. White to join his family for dinner at their home, which turned out to be a spot on the sidewalk on which he dined on chicken and vegetables, the most memorable meal of his sojourn. Leon Bibb raised his magnificent voice in support of civil rights. One August morning in 1968, Leon Bibb awoke in a plush hotel room at the Bayshore Inn in Vancouver. He looked upon peaceful Lost Lagoon and the forest of Stanley Park. In the other direction, he marvelled at a working harbour with snowcapped mountains as a backdrop. The singer knew he had found his promised land. He moved to the city two years later, abandoning a New York career in which he had played Greenwich Village coffeehouses as well as Lincoln Center; performed on Broadway as well as been host of a television variety show; sang at the inaugural Newport Folk festival as well as recorded more than a dozen albums for the Vanguard and Columbia labels, among others. That so distinguished a performer — a classically trained lyric baritone, who moved easily into the tenor register; a brilliant guitarist; a stage performer who had received a Tony nomination while sharing a stage with James Earl Jones and Cicely Tyson, who did not — chose Vancouver as his home did not go unnoticed by grateful citizens. His death on Oct. 23 at 93 was preceded by many honours, including induction into the B.C. Entertainment Hall of Fame and investment into the prestigious Order of British Columbia. Mr. Bibb had barely settled into his adopted city when he acquired the rights to “Jacques Brel is Alive and Well and Living in Paris,” which had an unprecedented seven-month run at the Arts Club, a landmark event in the establishment of live theatre in Vancouver. He performed pop songs with the Vancouver Symphony Orchestra, while some of his stage shows were turned into acclaimed CBC television specials. Those who heard Mr. Bibb sing in person never forgot it. Even in his 90s, his velvet voice could quiet a concert hall or a packed church. Gentle in demeanour, handsome like Harry Belafonte (a longtime friend), preternaturally youthful, Mr. Bibb was celebrated for honest, soulful renditions of even the most tired chestnuts. He was also praised for his lifelong advocacy of minority rights, a cause he furthered in Canada with a school program called “A Step Ahead,” designed and supported with his own money. Earlier, he braved threats of physical violence to join civil rights marchers in his native American South, also putting into jeopardy a career derailed for his having been blacklisted during the Red scare of the 1950s. High cheekbones, smooth facial skin, and an exuberance belied his age. At the height of his career, one encyclopedia supposed he had been born in 1935, making him 34. He was in fact 47 at the time. He remembered first singing in church as a boy at about age four, encouraged by a great aunt to learn “Ev'ry Time I Feel the Spirit,” an African-American spiritual. 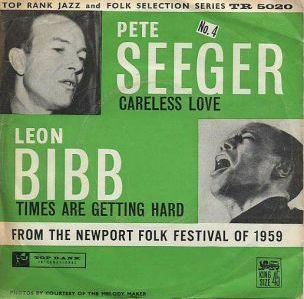 After graduating from Central Colored High School, young Bibb enrolled at the Louisville Municipal College for Negroes, where he was a featured soloist with the glee club. Early in his life, Mr. Bibb took as his model Paul Robeson, the superb bass-baritone singer, actor, athlete, author, and champion of working people and African-American civil rights. The men performed together and struck a fast friendship with Mr. Robeson named godfather in 1951 to Mr. Bibb's boy-girl fraternal twins. 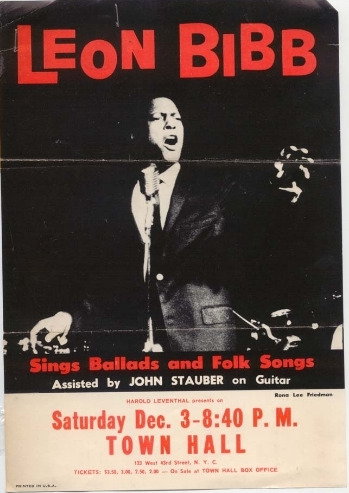 As Mr. Robeson was harassed and blacklisted for being pro-Communist, Mr. Bibb also came under scrutiny for having sung at such benefit concerts as a tribute to Emmett Till, the 14-year-old Chicago boy murdered in Mississippi in 1955. For a time in the late 1950s, Mr. Bibb performed on stage and in the recording studio under the name Lee Charles. In 1961, he signed and soon after renounced a statement commending the American Legion for being vigilant in rooting out Communists, a defiance of the blacklist that in the end had little effect on his popularity. 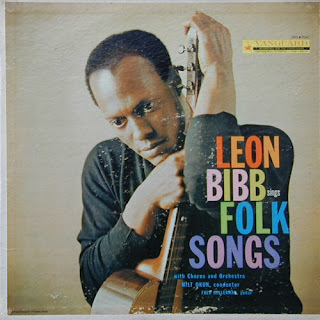 Mr. Bibb's smooth, soulful renditions of folk songs, English ballads, chain-gang chants, spirituals and gospel songs, not to mention Broadway show tunes, made him a popular guest on television variety programs. He appeared on The Tonight Show and the Merv Griffin Show, as well as the Ed Sullivan Show for which he made six live performances from 1959 until 1965. He also appeared regularly on ABC-TV on such programs as Hootenanny and Discovery ’64. In 1968, he sold the concept of a variety show featuring unknown and up-and-coming acts. Mr. Bibb served as host of “Someone New,” which aired on New York station WNBC. In 1963, he put his career on temporary hold to go to Mississippi to join civil-rights marches and voter registration drives. Two years later, he was in Alabama to perform for 25,000 marchers at the Alabama State Capitol building at the end of the Selma-to-Montgomery march. He appeared on stage with Mr. Belafonte, Joan Baez, the Canadian-born Oscar Brand, and Peter Yarrow and Mary Travers of Peter, Paul and Mary. It was while touring as the opening act to the comic Bill Cosby that Mr. Bibb made his first visit to Vancouver in the summer of 1968. Twenty-eight months later, his first marriage over, Mr. Bibb loaded up his possessions. “I drove across the country from New York with my furniture in a big van and got to the border and thought that I could just come on in to Canada: Here I am,” he once told Holger Petersen, the broadcaster and record producer. The Canadian customs officer gave the singer two days to get his papers into order. Vancouver in those days was still a rough-hewn, blue-collar port city with an operating cooperage just a few blocks from the downtown Orpheum Theatre, which itself barely escaped the wrecking ball. Mr. Bibb's first performances involved a two-part concert program at the University of British Columbia featuring blues and work songs, as well as anti-war ballads and the poems of Malcolm X. Even with tickets costing just 50 cents, barely half the ballroom was filled and Mr. Bibb could have been excused had he entertained doubts about his move. Not long after, he was stopped by police and questioned about a robbery, made a suspect solely for his skin colour. He eventually fought for and won an apology. Despite the poor welcome, Mr. Bibb cemented his reputation in the city with “Jacques Brel,” performing with Ann Mortifee and others in a smash hit, which sold some 40,000 tickets, making patrons out of philistines. A show in which Mr. Bibb adopts a dandy's persona while offering a singing history of the blues was presented at the Orpheum in 1977. Ranging in setting from a Harlem nightclub to a New Orleans whorehouse, the show was adapted as “The Candyman” for broadcast on CBC television, earning a rave review in the Globe. A sequel, “Candyman's Gospel Show,” aired in 1979. Mr. Bibb followed by writing a gospel cantata about the underground railroad. “One More Stop on the Freedom Train” premiered in Toronto in 1984, toured Ontario the following year, and was mounted in Vancouver during Expo 86. A career highlight for Mr. Bibb involved the release of two recordings with his Grammy-nominated bluesman son with “A Family Affair” (2002) and “Praising Peace: A Tribute to Paul Robeson” (2006). Through the years, Mr. Bibb maintained a steady appearance on the performing calendar in his adopted city, whether singing at the annual folk music festival, or appearing at a benefit concert. As he did in his early days, he liked to put aside the amplification of a microphone, allowing his mellifluous voice to fill the space. Mr. Bibb leaves twins Dorie Bibb Clay, of New York, and Eric Bibb, of Helsinki, Finland, and youngest daughter Amy Bibb-Ford, also of New York. He also leaves nine grandchildren and six great-grandchildren, as well as companion Christine Anton. He was predeceased by his siblings John Bibb, Harriett Porter and Edward Bibb. What would be Mr. Bibb's final public performance took place at Government House, the vice-regal residence in Victoria, in February, 2014. He was singing as part of celebrations to mark B.C. Black History Month. 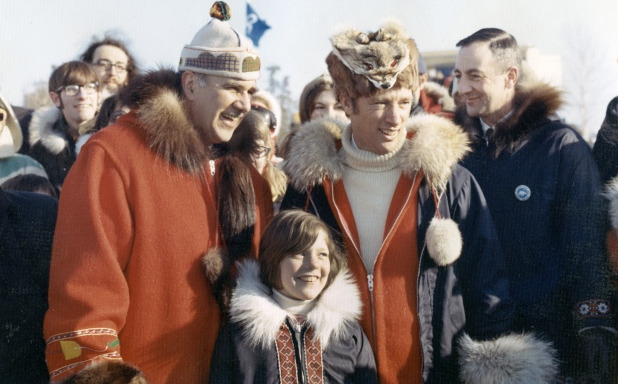 Stuart Hodgson (left) and Prime Minister Pierre Trudeau flank young Justin Trudeau. Stuart Hodgson dodged Nazi U-boats on frigid Arctic convoys before battling Communists within his union as he organized loggers on both coasts of Canada. Later in life, he built a distinguished career as a public servant, most notably serving as the first resident commissioner of the Northwest Territories. A towering man with large, rough hands and a booming voice, he displayed a good-humoured enthusiasm that verged on the comical. The New Yorker writer Edith Iglauer once described him as a “supersalesman for the North (who) always talks in exclamation marks.” The Inuit knew the jolly, mustachioed commissioner as Umingmak — musk ox. Mr. Hodgson, who has died at 91, was also a founding signatory of the New Democratic Party. Mentored by NDP Leader Tommy Douglas, he received his northern appointment from Liberal Prime Minister Lester Pearson, befriended his successor Pierre Trudeau, and, later still, served in several public administration roles in British Columbia with appointments from Social Credit Premier Bill Bennett. Stories by and about Mr. Hodgson are legion, perhaps the best known involving the union leader being approached about becoming commissioner by Mr. Pearson. “But I don't know that much about government,” Mr. Hodgson protested. “That's why I'm sending you,” the prime minister replied. The commissioner exercised one-man rule over a vast swath of the North American continent, a sparsely-populated expanse of 1.25 million square miles, a third of the Canadian land mass. His instructions were to begin a process leading to self-rule by northern residents. His administration coincided with a growing rise of militancy among younger native leaders and the commissioner earned criticism for his authoritarian approach to governance. As commissioner, he was a force unto himself, combining the roles of premier and lieutenant governor, as well as legislative speaker. “I am the government,” he once told a reporter. At the same time, he insisted his every edict was issued with the interests of the territorial population in mind. “I have 34,000 bosses,” he once said. Eager, gregarious, though unfamiliar with the Arctic except for his brief wartime experience, Mr. Hodgson was a superb choice for the transitional period. “I had gone north as a tourist, I suppose, looking for adventure and I returned home as someone who realized the enormous potential there,” he wrote in an unpublished memoir. He promoted tourism and mining, and established a civil service in the territory. He also found a lingering acrimony amongst northerners towards their southern rulers. The federal Department of Northern Affairs and Natural Resources, known as DNANR, was referred to by northern residents as the Department of No Action and No Results. The commissioner pushed the territory towards self-rule. In this role, he was on occasion referred to as one of the last fathers of Confederation. In his years in the north, he befriended commoner and royalty alike, from hunters on the frozen tundra to Prince Charles, who invited Mr. Hodgson to his wedding to Lady Diana in 1981. “I've always looked upon him as a friend,” Mr. Hodgson told Angela Mangiacasale of the Globe. “To think of all the millions of people he must have met, it's nice to know he feels the same way.” In the end, Mr. Hodgson had to send his regrets, missing out on what became known as the wedding of the century. 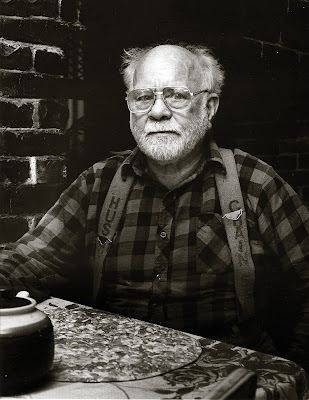 Stuart Milton Hodgson was born in Vancouver on April 1, 1924, a second son for Mary Louisa (née Allen) and Allan Jay Hodgson, a labourer at plywood mills on the Fraser River. The boy, who would grow to a strapping 6-foot-2, began working in the mills at age 15, taking a full-time job when he quit high school after completing Grade 11. With war waging around the globe, he joined the Royal Canadian Navy Volunteer Reserve. He served as an anti-aircraft gunner aboard HMCS Monnow, a frigate which escorted a convoy to the Arctic port of Murmansk in the Soviet Union. Mr. Hodgson and another gunner were credited with shooting down a German combat plane off the Norwegian coast. At war's end, a boarding party from the frigate accepted the surrender of a German U-boat. In 1951, he married Pearl Kereluk, a secretary originally from Hairy Hill, Alta., whom he had met when she asked him for a light for her cigarette. Mr. Hodgson's faction prevailed and he became a prominent figure in British Columbia trade union circles. In 1959, he was dispatched to Newfoundland to support what became a bitter, bloody loggers' strike. The death of a policeman during a brawl in the town of Badger and the subsequent incendiary words of Premier Joey Smallwood provoked a mob to seek out Mr. Hodgson at his hotel in Grand Falls. The organizer arrived shortly ahead of the vigilantes only to find the innkeeper had tossed his possessions into the snow. As Mr. Hodgson frantically tossed his clothes back into a suitcase, a passing cab driver asked what happened. Fell on the ice, he explained, and the expletive suitcase popped open. Mr. Hodgson took a seat in the cab, eager to make his escape. The driver was in no hurry. The mob was spotted coming over a hill towards the hotel. Mr. Hodgson, seeking to not betray his identity, not to mention his urgent desire to flee, politely asked if there was a way to avoid being caught in the jam. As they drove down side streets, the driver asked what brought the stranger to town. “Well, there's a strike on,” the driver explained. The cabbie later realized the identity of his passenger, whom he ordered out and left abandoned on the side of the highway. Mr. Hodgson and other union leaders eventually made their way to a deserted barracks at Gander airport where they hid for several days before seeking to leave the island. They tried to buy tickets on a flight to Ottawa, but the agent balked. “Not for you fellas,” he said. Meanwhile, word got out about the union guys being at the airport and a small but noisy group pursued them through the concourse. An alert Pan American Airways agent quickly got the men onto a trans-Atlantic flight that happened to be stopping in Gander to refuel. Mr. Hodgson wound up sitting in the front of the plane, where he convinced a stewardess to leave him a bottle of Crown Royal. It was only once he was in the air that he realized he did not know his destination. He was never so happy as when he landed in New York. An activist with the social democratic Co-operative Commonwealth Federation, Mr. Hodgson and his union played a central role in the creation of the NDP following the debacle of the 1958 federal election. But he soured on the new party after it failed to make a breakthrough in the subsequent campaign. He accepted a Liberal appointment to serve as a territorial commissioner. In 1967, as commissioner, he led two chartered propellor planes filled with bureaucrats and office furniture, as well as one civil servant's pet skunk, to the small mining town of Yellowknife, where the territory capital was established after decades of rule from far away Ottawa. The new government offices were temporarily located in a school, a curling rink and a bowling alley. Mr. Hodgson's tenure coincided with times of great change in almost all aspects of life in the North. The commissioner appointed Abe Okpik to head Project Surname, restoring to the people traditional surnames that had been replaced by the federal government with a series of numbers placed on disks like dog tags. A distinctive polar bear-shaped license plate was adopted in 1970 as part of centennial celebrations for the territory. The inaugural Arctic Winter Games were held that year, a brainchild of Mr. Hodgson's after he despaired at the poor showing local athletes made when facing southern competition. In 1975, he relinquished his authority to an elected council, an important evolution on the path towards self rule. On April 16, 1979, Prince Charles journeyed to Yellowknife to officiate at the opening of the Prince of Wales Northern Heritage Centre, a $5-million museum and archive which served as a showpiece for Mr. Hodgson's desire to boost tourism. The commissioner had also commissioned American artist Arnold Friberg, known for his monumental set designs for Cecil B. DeMille's “The Ten Commandments,” to paint a life-sized portrait of the Prince. Mr. Hodgson soon after left the north to serve as chairman of the International Joint Commission, which handles issues involving shared water boundaries with the United States. This was followed by a term at the helm of the BC Ferries and, later, as head of BC Transit. Mr. Hodgson then served as citizenship judge until his retirement in 2005. He was invested in the Order of Canada in 1971 for his role in labour relations and as commissioner. Pearl Hodgson received the Order herself three years later for her volunteer work in the north. As well, Mr. Hodgson was made a commander in the Order of Dannebrog by Queen Margrethe of Denmark. Mr. Hodgson died in Vancouver on Dec. 18. He leaves a son, a daughter, and five grandchildren. He was predeceased by his wife. In his time as commissioner, Mr. Hodgson tried to visit every hamlet in the territories at least once a year. The commissioner carried a rifle and sometimes a sidearm, but did not shoot game either for sport or sustenance. He was asked in one settlement why he did not hunt. It was reported he said his wartime exploits included shooting down the German plane. While most of the crew were rescued, one young man had died. For Mr. Hodgson that was enough death to last a lifetime. Art Finley prepares to go on air at CKNW in Vancouver. In a profession known for bombast, hyperbole and self-aggrandizement, radio talk-show host Art Finley stood out by relying on none of that. The broadcaster displayed a witty yet probing technique in on-air interrogations, making him “the thinking man's host” in the opinion of Red Robinson, another well-known Vancouver radio personality. 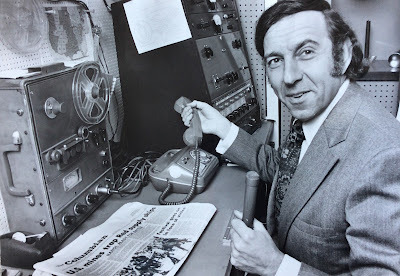 Mr. Finley, who has died at 88, first made a name in San Francisco before coming north to Canada in 1968, the year after the Summer of Love, quickly becoming a star in an era when talk-radio dominated the Vancouver scene. In a broadcast career lasting a half-century, the mellifluous host interviewed a Who's Who of celebrities and newsmakers including musicians (Joan Baez, James Brown, John Lennon), prime ministers (Pierre Trudeau, John Diefenbaker, Brian Mulroney), authors (Gore Vidal, Pierre Berton, Isaac Asimov), movie stars (Sophia Loren, Bette Davis, Arnold Schwarzenegger), television stars (Leonard Nimoy, Andy Griffith, Bill Shatner), healers (Dr. Jonas Salk, Dr. Henry Heimlich, Dr. Gifford W. Jones), and such activists and rabble-rousers as Germaine Greer, Huey Newton, Cesar Chavez, Ralph Nader, and Dr. Henry Morgentaler. He enjoyed a good laugh and had a wicked sense of humour himself, so took every opportunity to put on air such comedians as Carl Reiner, Mel Brooks, George Carlin, Jonathan Winters, Lily Tomlin, Phyllis Diller, and Professor Irwin Corey, as well as members of the Monty Python troupe. A voracious reader, the host said he gained an audience by listening objectively to the opinions expressed by call-in listeners and by not putting on airs with his guests. While he enjoyed a certain fame in British Columbia, his voice recognized by strangers even decades after he left the air, he made an indelible impression on a generation of Baby Boom children in the San Francisco Bay area as Mayor Art, the host of a live, after-school television program. His own childhood began in the rolling Appalachian coal mountains of West Virginia. Arthur Irving Finger was born in Fairmont to Minnie (née Zindler) and Benjamin Sardon Finger, a clothing merchant, on Aug. 25, 1926. He had two older brothers born more than a decade earlier. On his walks home from school during the Depression, young Art scavenged small chunks of coal alongside the railway tracks running out of the Monongahela River valley. He lied about his age to enlist in the U.S. Army Air Corps in the waning days of the Second World War. He was still an undergraduate when hired as a $36 per week radio announcer for station KXYZ. He held a variety of jobs at the station and took part in several zany stunts, including the sending aloft of silver-painted discs at the height of the UFO craze. By 1949, he was host and production manager of “Saturday at The Shamrock,” a weekly live broadcast on the national ABC network featured a big band performance from the ballroom of Houston's grandest hotel. It was during the show he had his first brush with meeting stars of stage and screen, and it was also where he met a hotel guest from New Jersey named Geraldine Molt, whom he almost immediately told he planned to marry. They did so eventually, though she insisted on a courtship lasting longer than his original 24-hour wooing. While serving in the U.S. Air Force during the Korean War, he helped establish military radio stations in Newfoundland. After completing his service, he spent two years in New York before moving to California to become a producer and performer on the “Tooneytown” children's show for KOVR-TV in Stockton. His wife came up with the concept — he would be Mayor Art and the children on the show would be his council. She fashioned for him a long-tailed morning coat and a top hat. An official at the station decided his venerable family name did not fit a kiddie show and he settled on the professional name Art Finley. The show, which soon moved to KRON-TV in San Francisco, aired live for two hours from 4 to 6 p.m. on weekdays. He introduced cartoons and offered a news program for children. He was aided by a hand-puppet named Ring-A-Ding, a wisecracking cuckoo-clock bird. In the fashion of the day, the host also did double-duty as pitchman, and Mayor Art was a fast-talking purveyor of Fudgees snack cakes, Buitoni macaroni, and fruit drinks (“It hasta be Shasta”). The children's show ended in 1966, after which he briefly played host to a low-budget afternoon call-in game show for adults. He also handled a call-in show on radio station KSFO and, beginning in 1962, had a daily cartoon published in the San Francisco Chronicle. The “Art's Gallery” cartoon featured an elaborate and detailed woodcut illustration from a 19th-century magazine with an anachronistic caption. The result — a medieval knight on horseback looking over his shoulder with the caption, “Is that cop still following us?” — was more wry than knee-slapping. The one-panel cartoon ran in the Chronicle for two decades and was syndicated to newspapers in Canada and the United States. In 1967, Mr. Finley and his wife became involved in an oddball caper involving a breakaway British colony. The residents of the Caribbean island of Anguilla, population 6,000, declared they wanted no further association with the nearby islands of St. Kitts and Nevis. An independent republic was declared and confirmed in a referendum by a vote of 1,739 to 4. The leaders rejected large sums from developers, instead seeking small donations from individuals to support the island. The San Francisco couple helped create the Anguilla Trust Fund in which honorary citizenships and passports were issued for donations of $100 US. (Among the donators was Linus Pauling, the scientist and humanitarian.) The idealistic hope was Anguilla would be a bastion of peace and popular democracy in a world torn by strife. In the end, the republic failed, but the island did become a separate British overseas territory. Mr. Finley was hired by Vancouver radio station CHQM in 1968. He soon after jumped to CKNW, a ratings juggernaut in news and current affairs, including a stellar lineup of talk-show hosts, the king of whom was Jack Webster, a gruff, acerbic, no-nonsense Glaswegian known as The Mouth That Roared. The newcomer's comparably laid-back style — “a mellow-tone voice with the octaval range of a slide trombone to wrap us in the warmest strains of rational charm,” in the words of Lee Bacchus of the Vancouver Sun — set him apart from the microphone maulers. After Mr. Webster was lured away to rival station CJOR for a reported contract of $110,000 per year, Mr. Finley replaced him in the coveted 6:30 to 8 p.m. slot. He returned to San Francisco to handle a call-in show for KGO in 1974, returning to Vancouver and a spot on CJOR in 1981. After five years, he hopscotched the continent with WNIS in Norfolk, Va., and XRA in San Diego, Calif., before becoming host of the popular “Nightbeat” show with KCBS in San Francisco. He retired to Victoria, B.C., from where he and his wife travelled the world. They were holidaying in Buenos Aires in 2006 when Geraldine Finger died suddenly of a heart attack on her 77th birthday. He then moved to Vancouver. Mr. Finley died on Aug. 7 after suffering a heart attack while on a stroll in his Vancouver neighbourhood. He leaves son Jeff Finger and daughters Julie Emerson and Suzanne Noel-Bentley. He was predeceased by his wife of 56 years and two brothers. In 2002, he donated a reel-to-reel tape and 141 audiocassettes to the University of British Columbia Library. The donation includes 100 radio interviews, ranging from cradle (Dr. Benjamin Spock) to grave (Dr. Jack Kevorkian). Available for future researchers, you might say the world has not heard the last of Mr. Finley. Art Finlay as Mayor Art was a staple of children's television in San Francisco.